In a tradition that dates back to IL-2 Forgotten Battles, those of us who enjoy eating baby cow pay tribute to the calf's requisite sacrifice by flying aircraft with skins inspired by the classic cow pattern. We are...the Black Veal Squadron, and in addition to IL-2 and TAW, we now have skins for the F-15C in FC3! Fortunately, the classic F-15 patten really lends itself to this, as you can see in the screenshots. Enjoy! Note the shoulder patch on the pilot. I opted for the high visibility markings and roundels because, lets face it: cows just aren't that tactical. Just in case you've forgotten. If I'm nothing else ........... I'm loyal to TAW. If you look hard you can just see Battie piloting the backup F22. I haven't forgotten, and I'm thinking about revising the BVS skin in TAW as well. However, I'll make you a personalized F-15 (with RAAF markings) if you wish it. Thanks, but only if its for TAW2.0. That would be a no then. Can't do a dedicated F-15 skin in TAW. You sure about that, Wombat? I added your nose art and even skinned you to reflect your rank of Brigadier. Don't worry; it was easy, and I did yours because I was doing stuff in batch. I can likely convert these to the A-10 as well. EDIT 1: Are you watching this. Amazing following regarding the F22. EDIT 2: Please read my last pm. I need directional guidance before proceeding. I have been keeping tabs on the F-22 in BMS. It has potential, although from what I understand only 2 MFDs are working at the moment. Might be a BMS limitation; as I recall earlier versions of Falcon could do 4 MFDs in 2D or HUD view, but 3D might be another matter entirely. BTW, Neph has a new ride! BTW, these googly eyes were a b1tch to do. Take a look at where the fuselage meets the wing root. The old "South Park" black cow has been replaced by Militant Marcie, a rather angry looking cow with crossed sabres underneath. Marcie is, of course, short for Marsala, but for some reason she doesn't like to be called by her full name. Also of note is something I've wanted to do to the A-10 for some time, but finally figured out where the texture was mapped. I speak reverently of the Lapping Tongue of DeathTM, the GAU-8 30mm cannon that has been painted red and sits just below those googly eyes on the nose of the aircraft. Not only do the enemies of the Black Veal Squadron feel our 30mm pain, but we get to stick our tongue out at them as we help them off this mortal coil! BVS has gone rotary wing! Note the black flightsuits with the cow pattern on the helmet. And Marcie (short for Marsala) as the door gunner. Tino (short for Sorrentino) mans the M-60 on the other side. Still working on the Mat Name to get the gunner helmets set to the BVS pattern as well. Version 2 of the BVS Huey, with some of the annoying bugs fixed and other enhancements. Here's an action shot. Note the new nose art, which is a take on the US Airborne slogan ("Death from Above", which was also popular with Vietnam door gunners), but with a cow-carrying tornado instead of a parachute. I thought the logo was inspired, but I'm also easily amused. The regular BVS logo is on the bottom of the helo, as well as on the tail. Also got the mat name for the door gunner helmet, so they have their own "Death From Above" helmet with "tornado wings", while the pilots still have Militant Marcie on their helmet. I colored the skid tips and rotor blades as well. Mad Cow Disease has spread to the other side of the Iron Curtain! Note the westernized markings on the Su-27, including the USN/USMC style Jet Intake markings. I have also put "No Step" indications on the wings in the right spots, replacing the Russian red X and "Do Not Paint" markings on the dielectric panels and near the pitot tubes. Additionally, the BV and tail number is outlined to match the Russian style numbers, though I still used the USAF Amarillo font since the jet markings have been westernized. Finally, the "standard" BVS noseart is being replaced by the latest Death From Above logo. I'm really liking the tornado wings! The only thing I haven't figured out how to do is replace the pilot skin with a BVS-suitable skin, so for now the Russian camo will have to suffice. As soon as I find the material name for the Su-27 pilot, this will change. Please welcome Longhorn, aka Sir Krankypants, to the Black Veal Squadron. He got his first guns kill against an IL-78 last night (which is no trivial matter if you're starting out in flight sims altogether). Welcome Skeeter to the Black Veal Squadron! We need to work on tightening up our formations, but we're getting there! Where's Wombat? We need him in that picture! 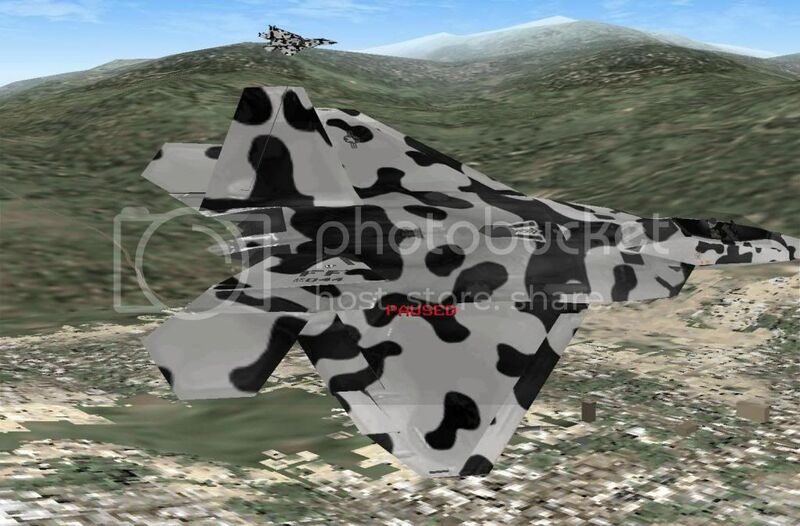 Why are you camouflaged as dairy cattle when you're clearly flying over land used for crops? Dairy cattle?! Bite your tongue; we're veal! BVS has added the hawk to the (ahem) stable of aircraft. Yeah, but those Fokkers were Messerschmitts! Welcome Eagle Flight to the Black Veal Squadron! We have the obligatory Su-25T and TF-51 skins with more to follow. But enough about that. Here are the screenshots.